Our last blog discussed trash brought to the lake by stormwater events on the watershed. While this accounts for most of the trash by weight and volume, littering by recreational users can be even more of a peril to wildlife on the shoreline. These photos were taken by Doc Ellen Tinsely, a wonderful nature photographer and lover of Jordan Lake's nature. Just as the water meter cover in the last blog offered proof that trash can come all the way from Greensboro when it rains, these photos offer sad proof that careless shoreline users are also causing serious problems. 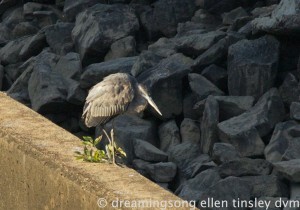 This Great Blue Heron is in serious trouble because of fishing line entanglement. In the second photo, the fishing line is pulling his right foot behind his left foot. He is doing a slow shuffle and trying to put the right foot down, but can't quite get the foot all the way down. He tries to peck at the line but is pulled off balance. He is pecking at the shiny spots on the tailrace because of hunger. But the lack of water will be his end. Or he may tumble down from his perch and not be able to break the fall. The Corps of Engineers has placed fishing line recycle boxes at the tailrace of the dam, a very popular fishing spot. Yet many fishermen ignore its presence. Fishing line is strewn all along the tailrace on both sides for hundreds of yards. It is extremely difficult work for volunteers to remove it. Once again, education is sorely needed to save wildlife from serious injury and death due to such careless and thoughtless behavior.